What are the goal statistics? The Statistics tab below the graph reports some basic facts about the goal and your progress so far. It's also a helpful place to quickly check goal parameters, most usefully the goal's current end date and value. This table shows you exactly how much progress you need to make over the next 7 days of the goal, in both the delta format as well as the total format. This is helpful if you're trying to work ahead on the goal to earn some time off — the table will tell you exactly how much more you need to do in order to be safe, for each of the next 7 days. The goal shown above is already safe through the 19th, as indicated by the checkmarks in the Delta column. 24 more minutes (shown in HH:MM format) are needed to be safe through the 20th as well. 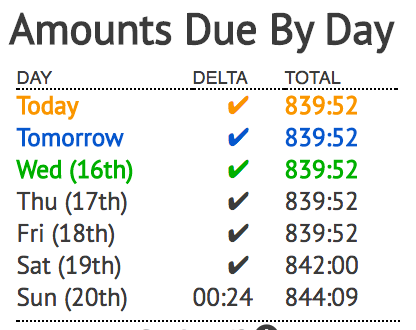 Once those 24 minutes are done, the goal will have 844 hours and 9 minutes done since creation, as shown in the Total column. The goal progress is a quick view of where and when you started, where you're at today, and where and when your goal will end. 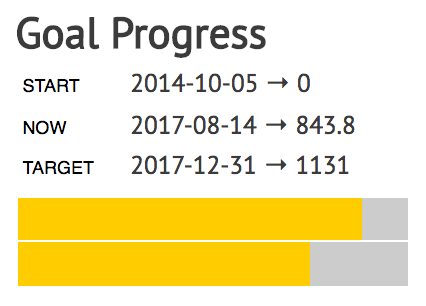 The two gray/yellow bars below are a visual representation of the same information: the top bar shows your goal's progress towards completion by date, while the bottom shows it by unit. The goal shown above began on 2014-10-05 and is scheduled to end on 2017-12-31. Today, the goal has 843.8 units since it was created, and at the end date it'll be at 1131. (Of course, if you change the goal in the meantime, that value will change too!) The top bar is further than the bottom bar in showing goal progress, because the goal's early rate was lower than its later rate — more progress will be made over less time as it winds down! 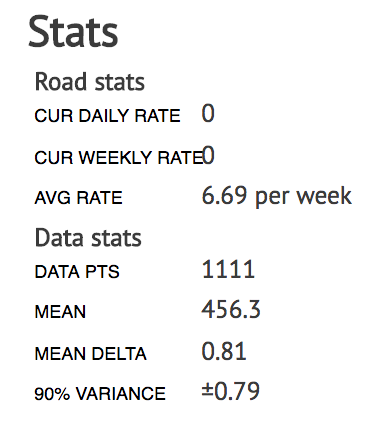 The Road stats show a little bit of info about your current and historical goal rate. The goal's current daily rate and its weekly equivalent are shown, as well as the goal's average rate since it was created. The Data stats do the same for your datapoints. 1111 datapoints have been entered on this goal, with an average value of 0.81 per day ( mean delta).